For those who may not be too familiar with this form of glass, tempered glass is a type of glass that is approximately four times more resilient than your “typical” glass. One may ask how a tempered glass case could be beneficial to their PC and the answer to that is fairly simple-a tempered glass can add a level of attractiveness to your PC while also adding the protective aspect of reducing the chances of your PC not overheating, while also lowering the noise inside of your PC as well and with the recent influx of online gamers, this is an immense benefit. As described above, the features of tempered glass for personal computers are quite impressive; tempered glass PC cases are incredibly attractive, while also adding a bit of “dazzle” to all of your computer and recreational needs. Depending on the case that you choose for your PC, it can be backed by mesh, plastic, or even pressed-steel (which is pretty impressive). Regardless of the reason, however, that you are looking into purchasing a tempered glass PC case make sure that (if you have a traditional tower) that you upgrade to a larger tower to include that extra space that you’ll want to maximize as much as possible. We here at ReviewCart are going to take a look at a few different tempered PC cases that are currently on the market and examine their pros and cons so that all of you gamers out there can effectively select the best PC case for your needs. The Phanteks PH-EC416PTG is a tempered glass PC case that is not only incredibly easy on your wallet but extremely functional as well. It comes equipped with magnetic dust filters (pretty impressive), full-size PSU support, and drop-n-lock SSD brackets that are included with the case. This particular case also has 120mm on both the front and back of the case, which allows for optimal flow-through and cooling. 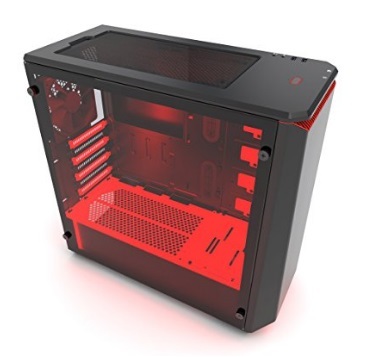 The pros of this case are pretty substantial; it is easy to build, has the optimal air flow which reduces the chances of overheating. Even more appealing is simply the price of this case, which is considerably affordable considering the design and functionality of it. Naturally, one of the biggest cons may be that this is tempered glass, meaning that even though it is resilient compared to “normal” glass, it still has the ability be cracked or broken. Also, dust accumulates quickly on the glass as well, which will require frequent cleaning. There are also issues, every now and then, with the LED lights- sometimes they are damaged upon arrival of the case or not working at all. Overall, the Phanteks PH-EC416PTG is a solid purchase, especially for how much your wallet will love you afterward! If anything, just like with all purchases, be mindful of what it is that you are looking for and what case will fit your needs the best. Naturally, make sure to hold on to that receipt as well, just in case any parts of the case to arrive at your doorstep damaged. Now, keep in mind that the Elite PC case is different from its predecessor, NZXT S340VR; this particular tempered glass PC case is cast from cold-rolled steel which makes it supremely durable compared to other best coolest full tower computer cases in its league; it is a mid-tower sized case, with an internal bay that is 3 X 3.5”, 4 X 2,5”, in addition to seven expansion slots. There is also a window built into this case that is made completely of all steel, which allows for the user to witness a full-view of their entire system and how it is operating. The purpose of this full-view is so that the user(s) can visually see the work that they have put it in (your efforts will not go unseen at all). 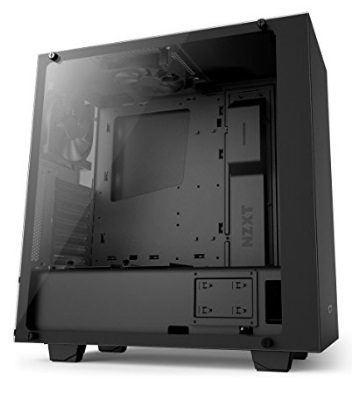 The NZXT S340VR Elite is also easy to build which obviously will make it easier on the user, not to mention that this case is quite compact- an aspect that is surprising due to the power and functionality that it holds. This case is also easily adaptable to most software; however, it still depends on what kind of software you use and how you use it. In addition to this, as with most tempered glass cases, the glass is just about flawless and this fact makes the case an amazing thing to look at while gaming or just doing general, computer tasks. Depending on where you purchase your NZXT S340VR Elite case from, and the distance that the case is traveling, it may be a bit scuffed so just ensure that you hold on to your receipt in case you need to exchange. In addition to this, although the flawless glass of the case is very appealing, the magnetic puck can also attract a ton of dust, which will lead to continuous cleaning. Lastly, there is no tool-less mounting option for those users who may want to use HDD/SSD. At the end of the day, for this tempered case, the Pros certainly outweigh the Cons; based on the Pros, the NZXT S340VR Elite certainly lives up to its name and offers plenty of value, with it being easier to install than the original S340VR, and the additional features that it offers. You may also want to determine how much space you use or will need, prior to purchasing this particular case, as there are many other options on the market that may fit your needs (again, this just depends on how much space you require for what you are using it for). 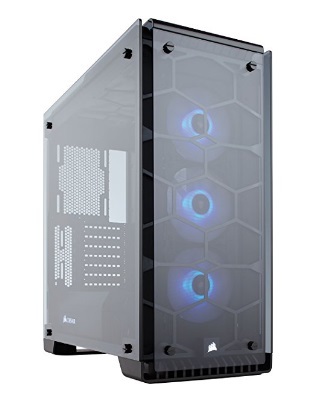 The Corsair Crystal Series 570X RGB features tempered glass panels (four in total), which are located on the top, the sides, and the front of the case. There is room for up to six fans (which can come in hand for many users), with the fans being compatible with radiators that size 360mm, 280mm, 240mm, 120mm and that are removable as well. The Corsair also comes with white LED lights that are on both the front panel, as well as the PSU cover (which is also removable). As with the tempered glass case described above, the Corsair Crystal is built so that the user can see every component of their build in flawless perception; this view also includes three SP120 RGB LED fans, with a built-in LED controller. The Corsair also has a direct flow of air that keeps the users’ PCU cooler and reduces the possibility of overheating. The first and perhaps the most prominent con is the price tag, which is pretty considerable compared to others that are currently on the market. The case is also pretty heavy, which is to be expected with tempered glass); in addition to this, there are only two SSD and two HDD slots so if you are an avid user this may be an issue for you. Lastly, the fans may be an issue for some- depending on the location of your purchase, you may have to wait a bit on replacement parts if your fans decide to go out unexpectedly, or in a short period of time. If your wallet fits this particular case then certainly go for it; it definitely lives up to its reputation. The style is pretty amazing and depending on what your uses are, you may have to make a couple of upgrades, but bottom-line, it is worth the purchase, if you are willing to spend that extra buck. It’s alright for the price. I like the window and the holes to route cables. I upgraded my system and needed a case to put the old components in and sell to a friend. I have an Antec 300 and thought I might use this case for my rig and use the Antec for the old parts. Wrong! You can tell this case isn’t high quality. It’s very light and the panels are thin and flimsy. If you want a case for a cheap build, this isn’t actually that bad. If you have expensive components, look elsewhere or prepare to be disappointed. As for the installation process, the motherboard covers the top left CPU 4/8 pin plug hole. You can try routing the cable first and then install the motherboard pinching the cable, however, it will be very tight. I routed my CPU cable around the entire motherboard from the right side since it was long enough. Also, if you are using an aftermarket CPU cooler, you will need to install the CPU cooler bracket BEFORE you install the motherboard. You cannot get to the top two CPU cooler bracket screws when the motherboard installed. The PCI expansion slot grills and front 5.25″ bay covers are reusable which is nice. The HD drive bays are very flimsy plastic but work ok. The sides of the front panel have built in “dust filters” but the holes are pretty big and I don’t think it will do a very good job at catching dust. Solid construction (for a sub $100 case). Side panel could be a little more solid. The brackets along the PCI slots in the back are pretty flimsy, I bent 2 all the way in half. luckily my video card takes up 2 spots. With the cons listed, I may be giving the impression that the case has a light/cheap feel, but it does not. Those were the only 2 pieces that I found lacking. The overall construction felt very solid and I at no point felt as if I about bent some part of it, as I’ve done before with cheaper cases.